This month I tried out an amazing pin, that has forever changed how I do sugar cookies. Well, I guess I will still have to do the cut-out cookies for that time of the year when angels, trees, and stars are in high demand, but for everything else there is SUGAR COOKIE BARS! Okay, these are awesome really, and awesome means easy and yummy. The recipe also makes a lot of cookie bars. I got about 30 good sized bars. I suggest when you put the dough in the pan, use your rolling pin to roll it evenly. It takes less than a minute but the results are much better. I did not have zest on hand and I omitted it, they were still great. After they are cooked, they will be slightly squishy in the middle. I would say squishy when pressed, but relatively firm and lightly browned. This is great and what you want them to be like, otherwise, they are going to seem dried out. Then, after you take the bars out, leaving them in the pan on a rack, give them a few minutes to firm up, and cut them while still warm. Do not take them out of the pan, just cut them. When cooled, frost the entire pan, and then remove them. I used the almond extract in the frosting and it was awesome. This is a great cookie bar when you need to feed a lot of mouths but don't have the time to cook cookies a sheet at a time. Trust me, this is a make again. 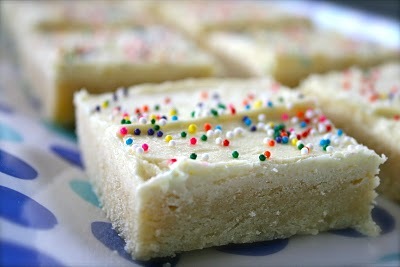 A great alternative to sugar cookies, all the taste without all the work! Topped with a cream cheese frosting. Combine butter and cream cheese until smooth and creamy. Add vanilla and salt. Add powdered sugar in 1-2 cup increments until combined, then add milk a little at a time and mix until smooth and spreading consistency. (You may not need all the milk). Spread over cooled cookie bars.